To mark the launch of Allen Solly’s new spring / summer collection called Colour Lab, the brand has come up with Allen Solly Look Book. Colour Lab claims to have 14 never seen before colours in chinos and shirts for men and denims for women. The objective is to create a buzz around the launch of the Colour Lab collection in the digital space by getting web celebrities to model for them. The app is simply a Look Book which invites you to take a look at the profiles of 14 web celebrities who have been photographed wearing apparel from the collection. 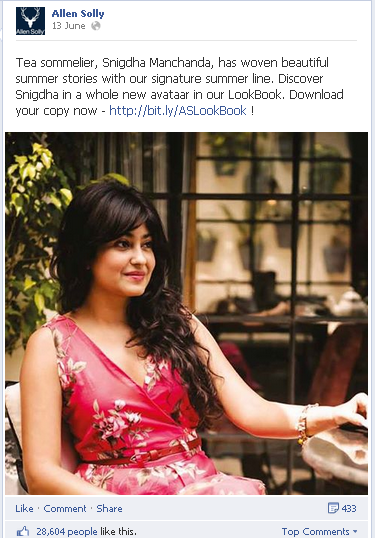 You simply have to flip a page of the ‘Look Book’ by clicking on the bottom of a page. Each celebrity’s profile contains information about them, what they do and about their experience while modelling for the campaign. 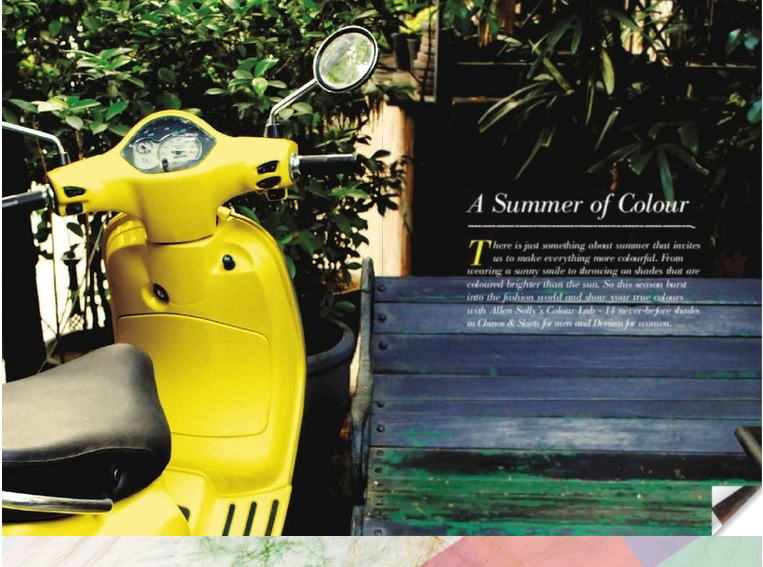 The Colour Lab photo-shoot was organised on 18 May as Allen Solly ‘Offline Clique’ at Cheri One Qutub in New Delhi. Professionals from eclectic backgrounds such as tea sommelier Snigdha Manchanda, television presenter Jatin Sapru, and entrepreneurs – Chandni Tolani, fashion editors and bloggers Charu Gaur and Riaan George, stylists Apurva Saxena and Shaily Khera, designer Arun Jay and mainstream actor – Aparshakti Khurana were invited. The Allen Solly ‘Colour Lab Look Book’ is now available for download on Facebook, is available on stores, has been mailed to all My Solly members. 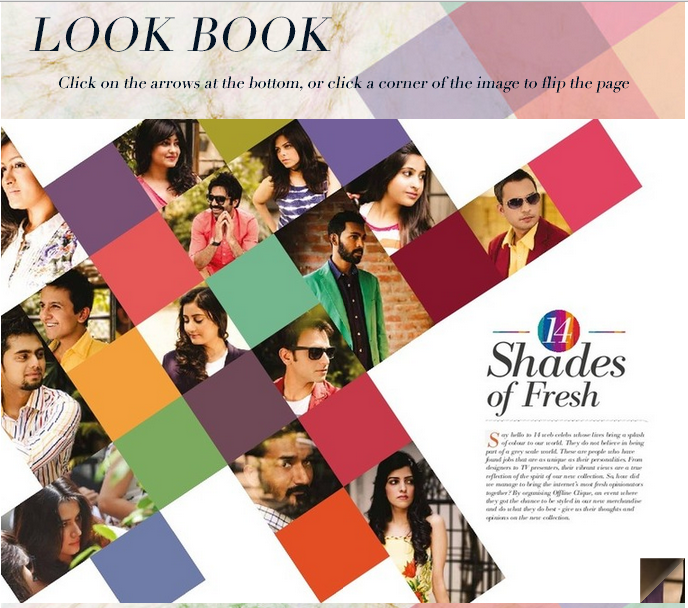 The ‘Look Book’ features a wide range of web celebrities from journalists and bloggers to designers and it got people talking about it online. All these people are actively engaged with their social media networks and they can promote the campaign among their own fans. Take a look at the response this post has received. Besides fashion, the brand has aligned iconic elements to its collection. These notable personalities symbolise success and they reaffirm the aspirational value of the brand. This campaign was executed just before their end of season sale. It was timely and it successfully created a buzz before the collection was up for grabs! The text giving the profile for each celebrity is too small to be legible. One does have the option of downloading the complete ‘Look Book’ but I doubt if too many users would bother with downloading a PDF. #ColourLab is the hashtag used for promoting the collection. Perhaps they could have used a branded hashtag to avoid confusion. Allen Solly has come up with great campaigns in the past, such as the End of Season Facebook Sale or the Twitter Powered Billboard. This campaign is different but has the element of engagement missing. Rather than just flipping pages using a cursor, making the app more interactive would probably have worked better. 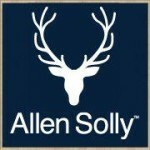 Allen Solly has come up with some exceptional campaigns in the past and compared to those, this one is quite average. With barrels of humour Sprite says #FakeOff! Swiggy's Lightning Fast Movies with AIB: "It was a good idea gone bad"
Writer. Black Sheep. Bubble wrap addict. Social media enthusiast. Work-in-Progress. Foodie. Flower child. Cat Person. Champion of curly haired characters. @tillwaytweets on Twitter.